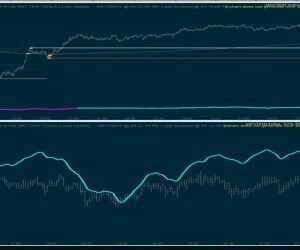 A few questions here regarding indicator lines on 2 attached charts from yesterday’s session please. I also want to make sure I’m correctly interpreting the condition of these indicator lines in relation to price …..for example a condition where line direction diverges from price direction. 1) What is Name of “Magenta / Blue Line” ? 2) What is Purpose of “Magenta / Blue Line” …….and How should it be used? 3) At <span class=”aBn” tabindex=”0″ data-term=”goog_731687403″><span class=”aQJ”>11am</span></span> the line color changed from Magenta to Blue. What is the significance of this color change from Magenta to Blue? 1) What is Name of “Red / Green Line” displayed in Price section at top of chart? 2) What is Purpose of “Red / Green Line” displayed in Price section at top of chart …….and How should it be used? 3) At <span class=”aBn” tabindex=”0″ data-term=”goog_731687404″><span class=”aQJ”>1pm</span></span> the line color changed from Red to Green ……,What is the significance of this color change from Red to Green? 4) Is there any significance when “Red / Green Line” crosses Above or Below Price? 3) At 11am the line color changed from Magenta to Blue. What is the significance of this color change from Magenta to Blue? Accumulation index is specifically designed to show emotional accumulation or distribution. This is extremely powerful during a consolidation So for example if the market is consolidating and accumulation index is trending up that gives you a pretty high confidence that the break will be to the upside. Similarly, if accumulation index breaks to a new high before the market breaks to a new day high – that is something to be quite aware of – especially if short. When it shifts from magenta/red to Cyan/Green this indicates – shift to confirmed accumulation or confirmed distribution. While the move above and below ZEROare important for this tool – they can be noisy and this function helps filter out the noise. 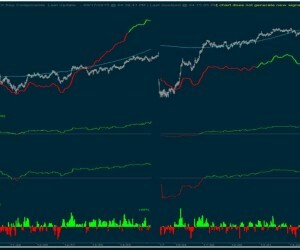 3) At 1pm the line color changed from Red to Green ……,What is the significance of this color change from Red to Green?